PaddleAir is always stoked to get unsolicited testimonials about the Ergo and how it is used and helps surfers around the world. 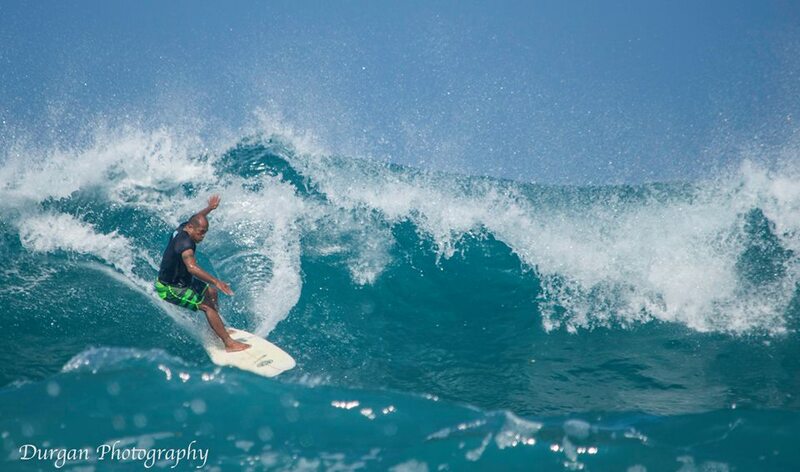 Below is one such review by Hawaiian surfer, Julian Shiroma. Included are two recent pictures of Julian surfing in an Ergo at his favorite surfing spot called Lyman's aka: Kamoa Point, Holualoa Bay, in Kailua-Kona, Hawaii, the Big Island. Mahalo for processing my order. FYI, this is my 3rd suit in about the last 6 or so years. The first two were short sleeve. I ordered the no sleeve to see if I like it better. 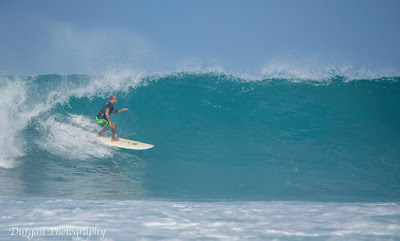 Other surfers ask me a lot of questions when they see me wearing it, which I do whenever the surf is big and lots of paddling is involved, esp. in Winter surf (now). I'm 58 years old, and the vest helps alleviate the aches and pains in my upper back and neck when paddling. I don't have to arch and contract my back and neck muscles on long paddles. Instead, I can push down (opposite muscle contraction) on my chest due to the air bladder keeping my chest/face above the water that flows over the nose of the board when paddling. I hope you can understand and visualize what I'm saying and describing. The vest also protects my ribs and chest from getting rash, but this has not been much of a problem for me because I don't have protruding ribs. I realize the vest is not designed to be used as a flotation device, but I have used it about two times when I lost my board in big surf and needed a little flotation help. Just so you know, it did serve me very well in the two instances and I didn't require assistance from others. Except for my friend Steve Gardner here, who introduced me to the suit, I think I'm the only other person who uses your product on the West side (Kona, Hawaii) of the Big Island that I live on, but like I said above, I get a lot of inquiries. I hope my answering their questions positively, will help increase sales for you. I really like your product and it definitely keeps me in the "game" that I've enjoyed since I was young. The Ergo by PaddleAir is available in your local surf shop. For a map and list of dealers see our website. Or you can purchase the classic short sleeve Ergo mentioned above here. The Ergo vest is also available online.